It’s hard to use the words “financially responsible” and “holiday party” in the same sentence, but, there, I’ll come out and say it. Like it or not, people just aren’t throwing big, glamorous parties the way they used to. Many of us are choosing simpler, smaller affairs with our close friends, relatives and neighbors. These get-togethers are not only easier to plan and less expensive, they can also be a lot of fun. We had budget-friendly gatherings in mind when we developed our line of Christmas Party Invitation ideas. Cookie exchange parties, tree-trimming gatherings, gingerbread decorating parties and spill-the-wine parties don’t have to be expensive. 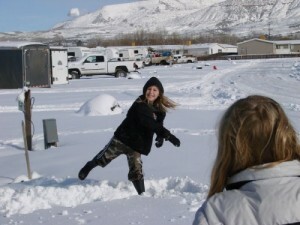 One of our customers hosts an annual snowball fight in her backyard. Treats include hot cocoa with marshmallows and cinnamon rolls. Formal attire is not required. Your presence is requested because you are loved (and because it will be a hoot and you won’t want to miss it). Sure, we love the formality of a sit-down multi-course dinner, complete with place cards, champagne and catered hors d’oeuvres. But sometimes the simple gatherings are the most memorable.